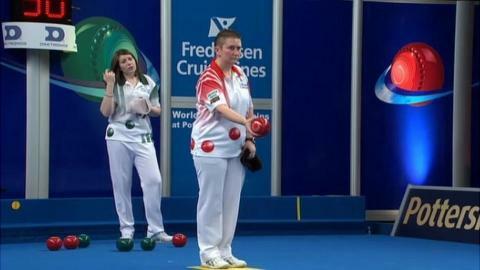 Norfolk's Rebecca Field beat Alison Merrien, from Guernsey, to win the World Indoor women's singles title. Field, 22, opened up a 7-0 lead in the first set at Potters in Great Yarmouth before taking it 11-7, only for Merrien to win the second 10-8. The tiebreak went to the final end with Merrien's last wood coming up short. It was the third occasion eight-times champion Merrien had lost a final on tiebreak, having been beaten by Debbie Stavrou in 2009 and 2010. Field, who was taking part in her first final, said of the last wood: "I wasn't too sure whether I wanted to watch it or not...on another day I would have been one down, but that's the way it goes sometimes. She paid tribute to her opponent, adding: "This lady is an absolutely credit, there's a reason Alison Merrien has won as much as she has done." Merrien, who last won the title in 2011, had no complaints about the outcome. "I had to fight my way back and almost clinched the first set, but she played better than I did in the end and deserved the win," she said.